In the many years I have lived here, I have seen the Virginia-Highland neighborhood move ever more toward the vision stated in the 2014 VaHi Master Plan: Become a model for modern urban living by demonstrating the potential to live in a healthy and sustainable way. Healthy living is our theme during the month of February, and will, in fact, be a recurring theme throughout the year, as we explore how these options contribute to the neighborhood we aspire to be. The Master Plan plan identifies a broad range of factors that affect healthy living, including environmental sustainability, active lifestyles, healthy food and nutrition, and opportunities for people of all ages, incomes and stages of life. Think about active lifestyles in transportation and play, and a wide variety businesses that support a healthy lifestyle – from shops that sell sports equipment to yoga studios and restaurants with healthy food choices. The opportunities for healthy living are many and varied to meet the needs of all ages and interests. 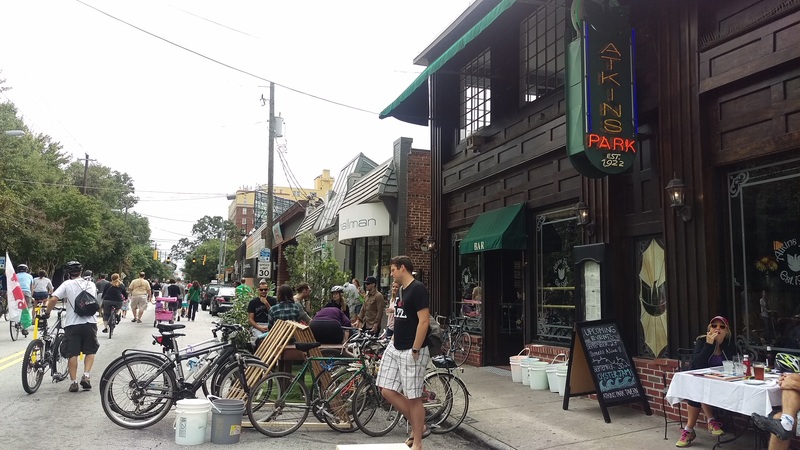 Start with the very low impact opportunity to walk around the neighborhood. We have a very picturesque neighborhood with many tree-lined streets, and commercial corridors with interesting shops. To improve this experience, the civic association is working with city government to add sidewalks where there are none, and through complete streets initiatives, to improve streetscapes for better safety of all. If you have a dog to walk with, all the better. Walk to the dog park at Piedmont Park to toss the ball and get exercise for your four-legged friend as well. Highland Runners weekly group run. This group is appropriate for all levels and offers both a three mile and a five+ mile group. They meet on Tuesday evenings at 6:30. Check out their website for more information. The VaHi Runners is a long-standing group that meets on Wednesdays in front of George’s on North highland at 7:00 pm. More information can be found at their meetup page. Races range from the Intown Ten (one of the few Peachtree Road Race qualifiers) coming up in early March–see following article; the very short Morningside Mile – tagline “dude it’s only a mile” – at the end of March; and the Summerfest 5K the first weekend in June. Then there is cycling with Atlanta Bike Coalition and other neighborhood groups, and new Relay Bike Share stations coming to the neighborhood this spring. Read more about the program here. It now appears that we are in line for three bike share stations within Virginia-Highland. Details are being worked through now by the VHCA parks committee. Walking and biking tours are also offered on the Atlanta BeltLine running adjacent to Virginia-Highland. Healthy food options abound for both dining and retail: our local restaurants have increasingly diverse menu options. Looking for more? We have an array of yoga, martial arts, swimming and other exercise oriented businesses, including spa and massage options when you just need to relax. Did you overdo it? We also have every service you might need from urgent care to chiropractors. Throughout 2017 we will highlight the practices, activities, and businesses that contribute to healthy living in Virginia-Highland. Do you want to be part of sharing our message? Send a note to communications@vahi.org and tell us your story, and make sure your event is on our calendar! This entry was posted in news and tagged healthy living by Stephen Cohen. Bookmark the permalink.